Ash is trapped in the old cabin and must sever the Deadite spirit anchor before the twisted creatures inhabiting the hovel feast on his soul. Somewhere in the darkest corner of the ghastly fruit cellar the long buried secret waits for him while the spirit responsible for the horrors unleashed in the woods bides its time for a chance at the Chosen One and its own unworthy salvation. 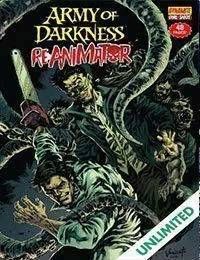 Its a return to Rami-esque storytelling as Army of Darkness goes Old School and revisits its roots in this tribute to grueling horror storytelling.